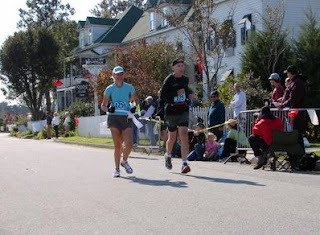 I'm looking forward to returning to the OBX Marathon for the 5th time this coming Sunday Nov 11th. Back in it's first year, 2006 I had not planned on running it but my training partner ,Karla The Marathon Princess had signed up right away. Of course at the time she signed up she didn't know that she would be battling cancer for nearly the entire year. 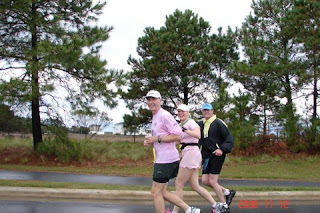 After we ran Boston, she had hardly ran at all over the summer but she still wanted to run OBX despite the fact it came just after completing chemo and she was now into radiation therapy. I decided I would go and run and support her and have some fun. The weather was nasty with high winds and heavy rain for about half the run but we had a good time and she actually ran faster than she had at Boston. Here is my report for 2006. 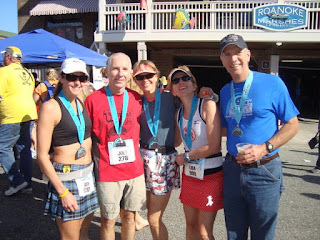 In 2007, I did a double running the Richmond Marathon for a BQ attempt on Saturday and then drove to OBX to run with Karla on Sunday. By now she was back to training well and getting close to her pre cancer condition. We were both surprised how well she ran that day and I was having to work to stay with her on my tired and worn out legs. Here is that report. I didn't run in 2008 but returned in 2009 and 2010. In both of those years I ran on my own to attempt Boston qualifiers but blew up and failed miserably both years. This year, I am not nearly in shape to go for the BQ and the only reason I signed up for the race so that I could once again run it with Karla. This will be our 12th time running a marathon together but it has been two years since the last time we've been able to schedule one. 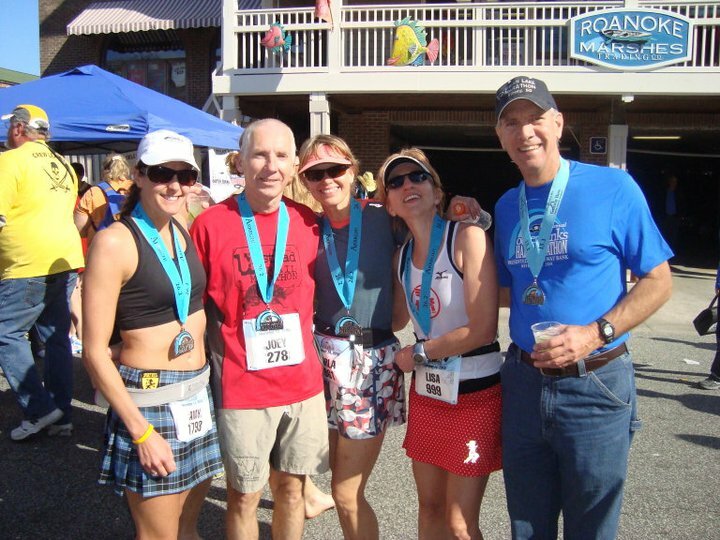 Karla has not raced since OBX last year due to a foot injury that kept her from running most of last Winter and she only begin to get back to normal training last Spring. I would like to say I can easily keep up with her but she has been running very well lately and I will be very happy just to keep up. And as you should know , Ultramom Amy and I are training together now to get her in shape for a BQ next Spring. She will be running with us Sunday for fun and as a test to see where we are in the training. The goal is to go for 4 hours. wish us Luck !